It is a problem known by some PowerBook G4 owners - the paint on the notebook sometimes scratches and chips. If you have owned your PowerBook for more than a few months, you may have already noticed this, even if you are very careful with your laptop. TiPaint has developed a touchup kit to cover up the blemishes and restore the cool factor to the PowerBook G4. TiPaint is a high-durability enamel paint that has been custom color-matched to cover up your PowerBook G4's blemishes. TiPaint also provides an applicator that makes it easy to get the right amount of paint on the problem area, along with simple instructions to help you get the best results. The kit sells for $14.95 and can be purchased from the TiPaint website. The Traveler CoolPad was designed to easily fit in any laptop bag. Nothing to attach or assemble, laptops run cooler, pivots 360 degrees, works with any laptop, and guaranteed for life. The Podium CoolPad is larger, has adjustable tilt, and weighs about 15 ounces. 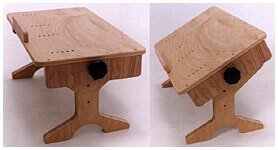 The stackable risers let you adjust the keyboard incline by 1/2" increments. The Traveler has fixed height and weighs about 9 ounces. Both CoolPads work fine with the largest laptops, and both pivot 360 degrees. Increasing the air space under your laptop allows better heat dissipation. Most laptops dissipate heat through the bottom, and the more air that's allowed to flow under the bottom, the better chance that heat will dissipate. As you know, if you place a running laptop on a bed it will probably overheat, as air will not flow under the bottom. The CoolPad increases the airspace as well as elevating the back. The six small rubber pads on the bottom of the CoolPad really grip - a great tool for air travelers whose laptops slip off tray tables. The CoolPad allows you to easily pivot your laptop so everyone gets to see your dazzling PowerPoint presentation without rubbernecking. You can find your own comfort zone with the rock-solid adjustable keyboard tilt. If you prefer a negative keyboard tilt, just turn the CoolPad around and adjust the height. The base plate's trapezoidal shape and the Lexan risers provide a rock-solid, stable base for serious typists. Furniture friendly rubber feet really grab any surface. The $29.95 adjustable Podium CoolPad is best for full time use on your desk. The smaller, lighter $19.95 Traveler CoolPad is more portable. A bundle deal gives you both for $39.95. All Road Tools products are guaranteed for life. CoolPads are made and assembled in New Hampshire. The sleek, minimalist SleeveCase keeps your laptop out of harm's way without taking up much space. A plush layer of high grade neoprene wrapped in a Ballistic shell surrounds and protects your computer. The ultra smooth neoprene skin makes sliding your laptop in and out a snap. Available in Black Ballistic nylon with Lead Indium trim. For more information, visit SFBags. The G3hinge group is for owners of Apple laptops that have encountered the numerous number of defects in these units: power adapters (brick and yo-yo), sound, modem, display, hinges, and many others. This suit has not been filed yet but with each additional case reported in the database, it is a step closer. BookEndz allows you to connect or disconnect a video monitor; network; USB printer, hub, keyboard, and/or mouse; audio in and out; SCSI devices; and power in less than two seconds. BookEndz enables you to connect and disconnect your desktop peripherals quickly and efficiently. By doing so, if effectively converts your PowerBook to a desktop computer and back again. It allows your PowerBook to use USB, SCSI, and ethernet to connect with scanners, trackballs, networks, printers, or modems with ease. There are connectors for Audio In, Audio Out, S-video, Composite Video, and an external monitor. It even has a reset switch. That means no more cables falling behind your desk. No more connector and port matching. No more delays. And no more hassles. The E.G. Laptop brings relief from back strain while reading, writing, or using a laptop computer when you are in bed, on the floor, or on a sofa. Place your legs under or around it for maximum comfort. It is ready to use, made of top quality birch plywood. The E.G. Laptop measures 11" x 20", is 9" high, and weighs 4.5 pounds. When you just need to carry the bare essentials - computer (or mini projector), media, pens, and paper - this trimmed-down version of RoadWired's Standard @ttaché is a sharp and efficient way to do it. You might be surprised to find that there are 16 pockets and compartments inside this compact and elegant bag. It can be embroidered, silk-screened, or custom labeled, depending on quantity. 16 pockets and compartments hold and organize notebook computer up to 12" x 12" x 2", discs and/or PC cards, pens and paper. Top-loading design affords instant access at at airport security or in tight quarters. Main compartment protected by shock-absorbing interlinings and double-padded floorboard. Adjustable padded divider panels allow for exact, "customized" fit. Removable ticket/passport organizer can be worn as discreet waist pouch when traveling. Elasticized media organizers in separate front zipper pocket hold CDs, PC cards, etc. Exclusive Hide and Go Home "secret pocket" hides emergency cash, key, etc. Contoured, 4-layer shoulder pad with moisture-wicking mesh and friction strip overlays. Stays put-with incredible comfort-when bag is heavily loaded. Possibly the most comfortable carrying handle you've ever grabbed-just the right size, just the right rigidity, and just the right cushioning. A little detail that makes a big difference! Full-support webbing connects to shoulder strap and hand grip in a continuous loop-supports bag securely and evenly, and from the bottom, rather than the sidesÖ no "bag sag!" Smooth nylon panel on back of bag protects your clothing from wear-and-tear. Multiple clip-on points on both exterior sides for cellphone, accessory pouches, I.D. tags, etc. plus business card holder, divided see-through organizer pockets, magazine pocket, and more! Heavy-duty RoadWired luggage tag included! Additional tags available in "Great Gadgets" section. Primary materials: 1050 Denier Ballistic Nylon with neoprene accent/protection panel outside. Scratch-free interior lined with smooth nylon pack cloth. All materials water-repellent. Overall Size: 12.5"L x 12.5"H x 2.5"D. Weight: 2.4 lb. The Compact @ttache is also available for US$79.95 from DevDepot. Terra Soft Solutions, Inc. is now shipping Yellow Dog Linux 2.2, which it claims is the most mature and complete PowerPC Linux distribution available. Yellow Dog Linux 2.2 offers an array of improvements over v2.1 with the most advanced, stable release of the 2.4 kernel, improved support for the Apple ADC monitors, and accelerated video. The screen brightness and volume control buttons are now supported on NewWorld ROM Apple PowerBooks and iBook computers. And while the latest release of KDE is an appreciated improvement, Gnome has taken a stunning leap forward - giving Mac OS X a run for its money says Terra Soft - exceptional by all standards. With movement into high performance computing supported by the release of Black Lab 2.0, YDL now offers 'HPC Node' as a package selection, in addition to 'Base', 'Home/Office', 'Developer Workstation', 'Server', and 'Everything' options. "The means by which this latest YDL release came together clearly demonstrates the cohesion and professional relationships that have grown within the open source community. While our in-house experience plays a significant role in the maturation of YDL, the unified effort of the community continues to make YDL possible. Many thanks to everyone who worked with us," states Dan Burcaw, Terra Soft Solutions CTO.